Patricia is a electrical engineering student who is always ready to share some tips for her fellows students. She kindly proposed to publish her essays here and if you want to do so as well, as usual you just need to send us a mail. Private overhead electrical lines (POELs) are those which transport lines from the main switchboard and meters to a specific building or house. There are many schemes out there about private lines and all of them begin at the point of supply. The private poles and wires inside the property boundary of the homeowner are his one responsibility. As an electrician or electrical contractor, it is advised to check and inspect these lines every year to limit the risks of electrical shocks and injuries which can lead to costly litigation in the site owner. What issues can be found in POELs ? This is one of the most common and dangerous faults in POELs. Trees and limbs can damage electrical lines when not well installed. It is recommended by the electricity safety regulations 2010 that the minimum clearance for vegetation allowed is 1 meter for insulated wires and 2m for bares wires(for span between 45 and 70 meters). And In case of trimming, just have a professional tree clearing contractor for that. They are dangerous. Why? Because the wires exposed can still be live which is very hazardous for people living under or around such cables. The vegetation touching these cables could get burnt leading to a potential risk of bushfires. Zspecially Woods’s ones. Termites, bad weather conditions or overloading of poles (with other services cables for example ) can seriously affect the pole while reducing its lifespan. tThis is one of the direct consequences of the previous fault. When one cable hangs much lower than the other in the same section, both of them are out of sag. The normal level of resistance allowed to this cable has been reduced or the guy wires are got bad and such situations can become harmful because they increased the risk of conductors clashing. Defective meter boxes, ties, stays or chipped insulators are not negligible faults which can affect the safety of people living in those sites. It is on the responsibility of the homeowner to maintain his private installations at least every six months. When it is not possible, he call for a certified electrician or contractor. Distribution companies in the other hand should maintain the lines every 03 years to make sure that everything is correct and in case of problem, they will notify it or even disconnect the lines with no previous notice if they find the situation extremely hazardous. Since this is one of the causes of bushfires, it is then obvious to start with that. Look at the clearance, span between poles and trees as well as the species which were there or which have been added. Only vegetation with good growth habits are allowed to remain on the site. If that clearance it is no more respected, you should correct that while using appropriate spreaders and other supports to carry them. They support the lines with all their hardware. 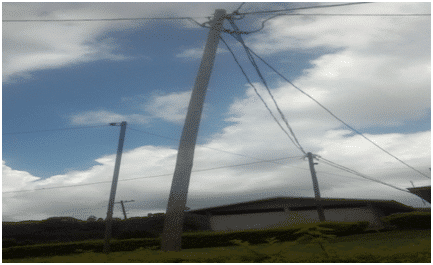 When the pole is overloaded with wires, or it is going to fall, check the state of the pole. If they are no more heavy/ frayed or the bottom of poles is not stronger enough, ask for an inspector to allow changing them. It might happen that new buildings have been constructed around the private lines. While it is allowed, you should verify if both vertical and horizontal clearance have been respected. The minimum building clearance allows for spaces accessible by persons is 3.7m for bare live conductors, 3.0m for insulate live conductors or 2.7m for neutral conductors. In case of any doubt, call an inspector about the new building clearances in your areas (swimming pools…) . Are they still well insulated? If it is not the case replace the entire wire not only a portion. If more than 20% of cable has to be changed, consider an underground solution. Are there still well connected? Stay, point of attachment or fuses are still well fixed or not? It is your responsibility to identify which material should be replaced and which can stay. Corroded materials should be changed. Depending on the area (used or not by vehicles) and the type of conductors, a minimum distance should be respected. Call an inspector to know more about such important information in your jurisdiction. Power works should be performed by experienced electrical contractors and an electrical safety notice should be issued after working. Depending also on the level of defect encountered (non-urgent, hazardous or urgent safety) the contractor will not operate immediately. The contractor should also establish a detailed program about the responsibility of the customers and the limit of maintenance allowed. Underground installations are a better choice: they limit the risk of direct contact with people, trees or vehicles. Always be aware of the new rules and regulations and keep in touch with your inspector. Do you have other tips to maintain private overhead power lines? or copy this trackback: http://engineering.electrical-equipment.org/safety/7-steps-maintain-private-overhead-power-lines.html/trackback from your own site. Yeah! These are the main issues found in POELs, Vegetation disturbance, Conductors damaged, Deterioration of poles, Conductors out of sag, Broken/fallen of attachments.